InventHelp®, America's leading inventor service company, announces that one of its clients, an inventor from Colorado, has designed a modified cutting board to include a large, hinged blade for slicing food. This invention is patented. 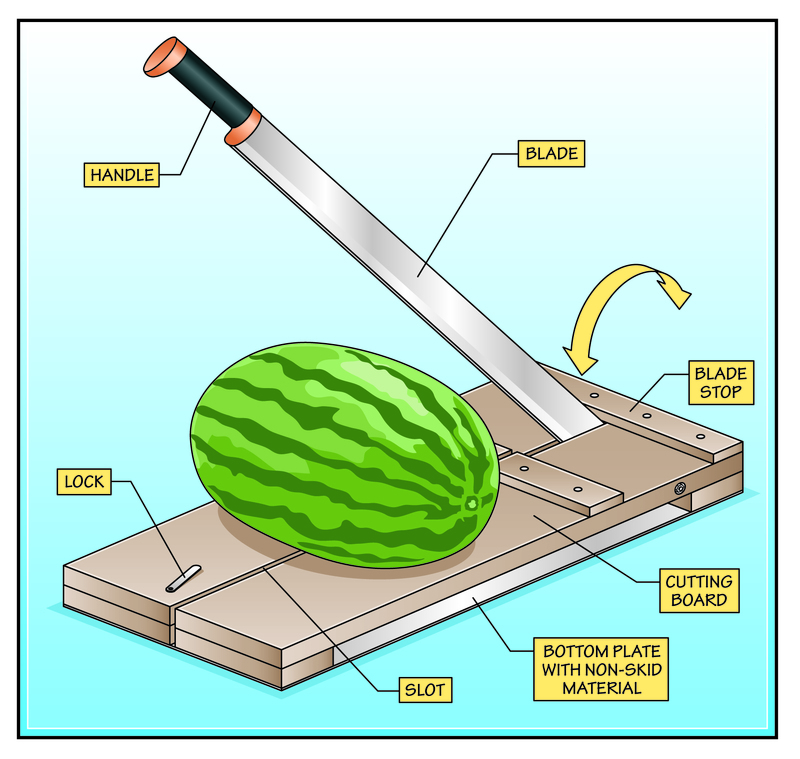 The "Extreme Slicer" would ensure even slices as it features a secured blade attached to the cutting board. A user could save time and effort on food preparation due to the design features of the Extreme Slicer. The labor-saving kitchen device would feature a lightweight, portable design for easy storage and transport. The Extreme Slicer would consist of a cutting board with a large blade attached to one edge. The board would measure three inches thick, 24-inches long and 11-inches wide. The blade could be made of metal and plastic and feature a rubber handle. A slot would run along the length of the center of the board. One end of the blade would be hinged into the slot, allowing the handle to be lifted up and down to slice food. A blade stop would be positioned at one end of the unit, behind the back of the blade. The blade stop would allow the blade to stand up by itself and keep it from going all the way over. The underside of the cutting board would be supported by blocks on either end. The central portion would be hollow. A plate made of non-toxic material could be positioned in the hollow section to catch food and juices, and as protection from the blade at the bottom. InventHelp® is attempting to submit the invention to companies for review. If substantial interest is expressed, the company will attempt to negotiate for a sale or royalties for the inventor. For more information, telephone Dept. 09-DVR-234 at (800) 851-6030. Learn more about InventHelp® and their Invention Submission services at http://www.inventhelp.com.